Overall, I'm pretty happy with the outcome. This grow had it's challenges from the beginning, but despite rough conditions for the first part of her life, she managed to be the healthiest of the four plants I started this run. I really see the potential for some amazing bud! The smell coming off this lady is incredible! 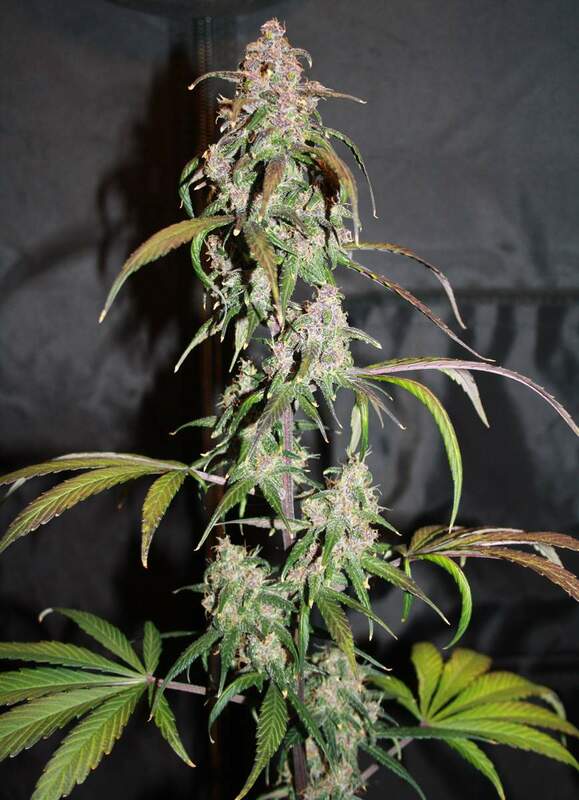 Her buds started to turn a nice shade of purple as she matured as well. I really cannot wait to grow another one of these amazing beans and give it proper attention this time... the next one will be way better. Ended up with just shy of 95g wet bud and around 30g wet trim, not the largest yield ever but I cannot wait to try these buds! I'm looking forward to trying this strain again now that there is not so much going on in my grow space. I think overcrowding and poor ventilation caused a lot of problems this run. I am just letting a few plants finish up and them I'm back to a four plant rotation... starting two seeds every 30-35 days. I see the potential for some incredible quality buds, can't wait to see the next one. Will update dry weights and a smoke report in a few days. I probably had closer to 30g, but I "tested" a bit and forgot to get my dry weight and final pictures.... So I'll record it as it was when I realised. Really nice smoke, that berry taste and smell shines through in the finished product. I like it so much, I already started another one. Awesome harvest. Love the black purple color on em! @TeflonDonFarms, Me too! I need to do another one of these and do it properly this time. I love the smell of this plant. Not gonna end up with much from this one, but what's there looks real nice.